On Saturday my baby turned six. I'm not really happy about that at all. I'd just as-soon she stay my baby for a bit longer... but she's already saying "ma-uuuhm. I HAVE to grow up, you have to let me." with that "duh" tone of voice usually coming from a girl twice her age, punctuated by a flip of her pony tail. She bounced out of bed and I could hear her coming down the hall shouting, "I'm six! I'm six! Today's finally my birthday!! We celebrated pretty low key. She picked out the dress she wanted to wear to church, asked for a special hair-doo, (she's all about her hair these days...) chose our menu for lunch and helped me put together the strawberry poke cake she'd requested. She's growing wiser as she ages. She opted to forgo all the traditional birthday trappings of balloons, streamers and pretty paper plates for additional gifts. The biggest surprise was the fact that she hasn't mentioned her plans for her next birthday party yet. I guess she really is growing up. It took some real doing, but we finally got a couple of descent photos of her. Lately, when the camera comes out, all we get are those plastic, beauty pageant smiles - the ones with the cocked head, squinted eyes and for some unknown reason, her "prissy" hands up in the air. 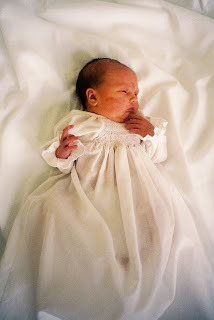 But now that I look at her 1 day old birth announcement photo above I can kinda see a hint of the prissy hands emerging. Gifts consisted of Webkinz from her brothers (they managed to get them free when they bought one for themselves at some Webkinz doo-dah in April.) a bathing suit cover-up from Gramma and Grampa, a My Little Pony and coloring book from her friend, Sara, some Disney Princess shower gels (that I picked up on clearance after Christmas intending to give her for Easter...) and with the money that Nana and Pawpa gave her she was able to buy the horse and carriage for her dolls that she's had her eye on. She also ended up with quite a wad of cash from various people at church. I'm fairly certain it didn't come from the offering plate. When we welcomed Michaela into our family six years ago we decided three kids was perfect and retracted our previous plans to have four. As a toddler we were stunned that she was harder work than both of the boys had been put together. If there was a mess to be made - she made it. I was convinced that she was the true fulfilment to my mother's curse for me to "have one just like yourself" - the boys had merely been warm up! But her charm and gentle spirit quickly won us over. She has the kindest, servant's heart of any child I've ever known. She's the first to grab a baggie of ice cubes for a brother's scraped knee, the first to see if you're OK or tell you everything will work out fine and urge you not to cry because she loves you. She offers hugs and kisses freely and always has an encouraging word. In short, she's been such a wonderful blessing to us. The little tike is growing up...I've got some stroller pix of her holding S hands at a pumkin patch outing...very motherly like, to cute! Happy Birthday mom just think your that much closer to having a pre- teen..oh I meant closet thief no I meant shampoo stealer..guess I better stop there! She really does look older than her 5th birthday tea last year. I can't believe that was when I didn't really know you. Time flies. Anyway, she is such a blessing to your family and I love being around her. Oh, and I forgot to say how beautiful her baby portrait is!! Soooo precious! I really dig that princess of yours she cracks me up, but they seem to all have a knack for the comic relief I wonder where they get that from?? ;) ;) Happy Birthday to you...la la la. Love her smile in the photos and that cake looks YUMMY!!! !